I don’t know what it is lately but I have been addicted to making popsicles. Wait… I know exactly what it is. It’s the sticky hot, sweaty, no air conditioning, who cares what my frizzy hair looks like, hot summer weather we’ve been getting. THAT’S why I have been craving nothing but sweet, delicious, cool popsicles. Yeah I know right!? Aren’t they just the cutest little popsicles you ever did see? The colour… those little chips. Even better is the taste. 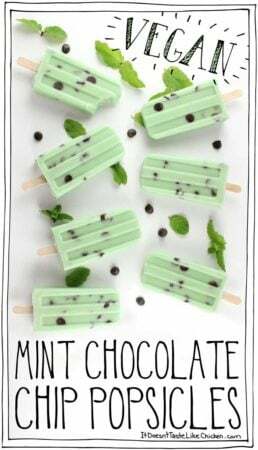 Creamy, lightly sweet, and minty with bites of chocolate chip throughout. 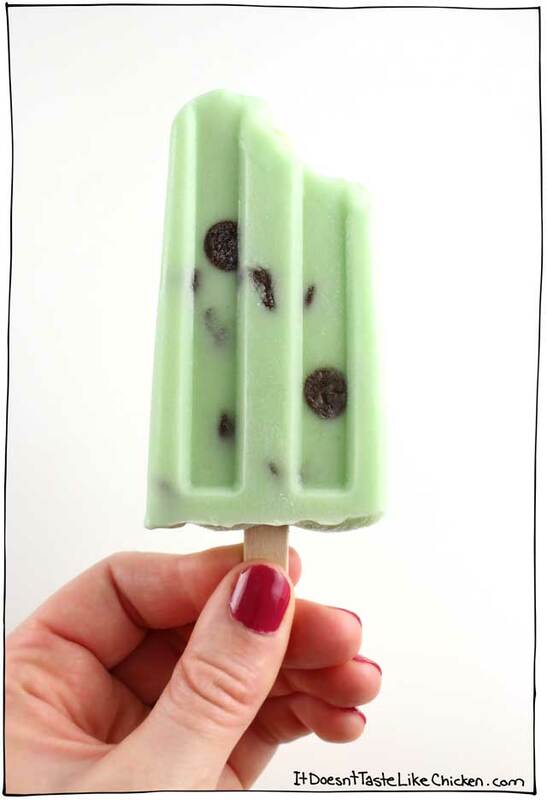 It’s like a slightly lightened up version of mint chocolate chip ice cream, AND it’s on a stick. What’s not to like? Just a second, we’ll get back to Vegan Mint Chocolate Chip Popsicle in a minute, but first I have to tell you about the picture above in case you missed the story on Instagram or Facebook. This past Wednesday, Appetite by Random House, called me into their office for a “sales meeting”. I studiously whipped out my note pad and was ready to pretend like I knew how to sell a book, but it was all a sneaky trick. There was no “sales meeting”. 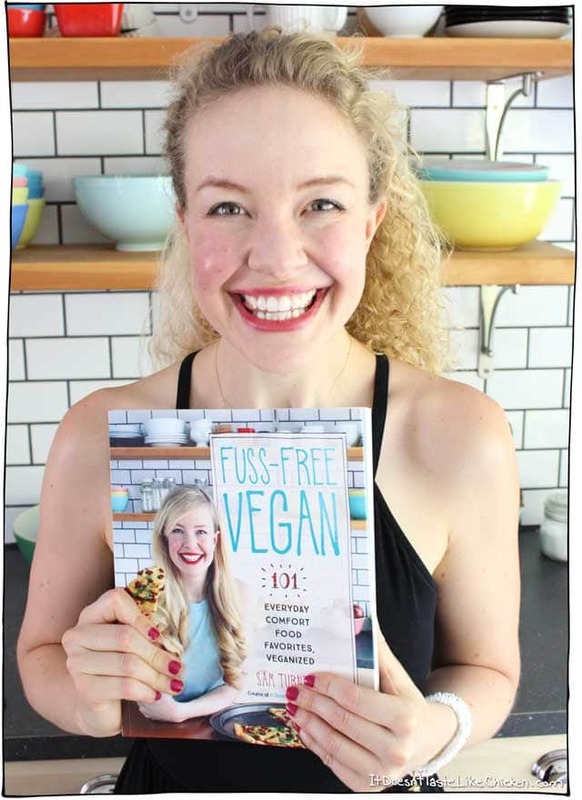 Much to my surprise, they instead presented with my very first ever copy of my cookbook Fuss-Free Vegan!!!!!! It feels so surreal to have my hands on an actual real book that I actually really wrote! It’s totally overwhelming. I can’t show you guys much yet, but just to give you an idea of how much work I put into this book, I wrote and tested all of the recipes, I took all of the photos myself, even the cover shot, (and there are a LOT of photos), I designed my own font, and I was nitpicky about every square inch of this book as I wanted to make sure that it was the best book I could possibly create for you. So, to have the results finally in my hands is a magical moment. I just can’t wait to share it with you!! 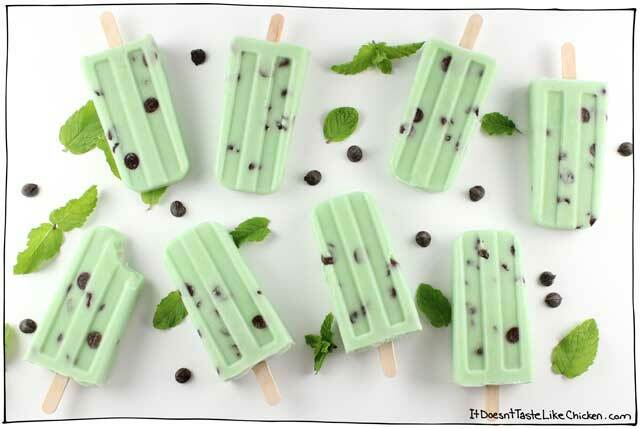 Back to Vegan Mint Chocolate Chip Popsicles. 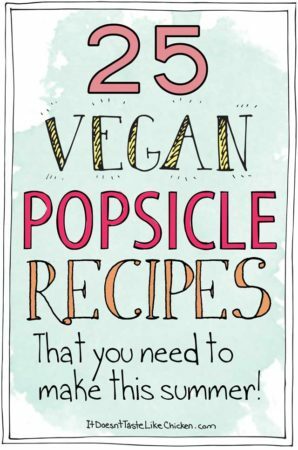 While I do have vegan ice cream recipes in my cookbook, I don’t have any popsicle recipes, so I can go ahead and continue to create sweet frozen treats to share with you this summer. 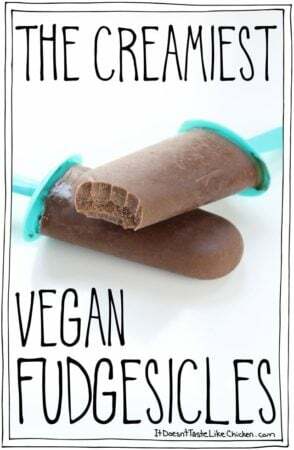 To make Vegan Mint Chocolate Chip Popsicles: Add the non-dairy milk, coconut milk, sugar, and cornstarch to a medium sized pot and whisk well making sure the cornstarch is completely mixed it. Put over medium-high heat and bring to a simmer while whisking often. Simmer for about 5 minutes until the mixture thickens, being careful to not let it boil over. 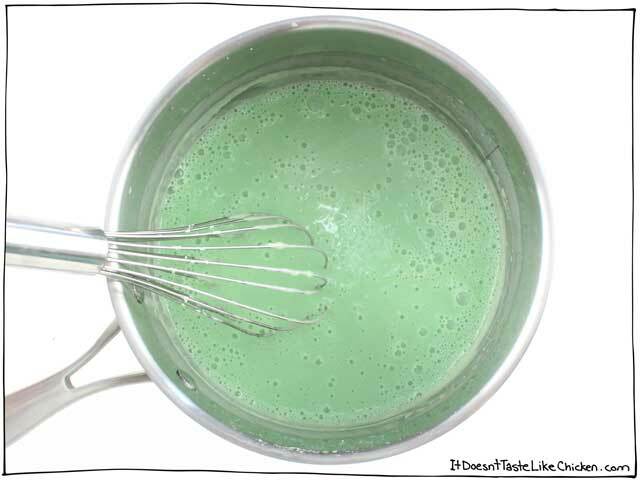 Remove from heat and whisk in the vanilla extract, mint extract, and food colouring. I had a funny lime green food dye on hand so I added about 4 drops of the green and 1 tiny drop of blue which made this perfect mint colour. You can play around with the colour as you like, make a totally different colour, or just skip the dye all together and leave the popsicles white. It’s up to you! 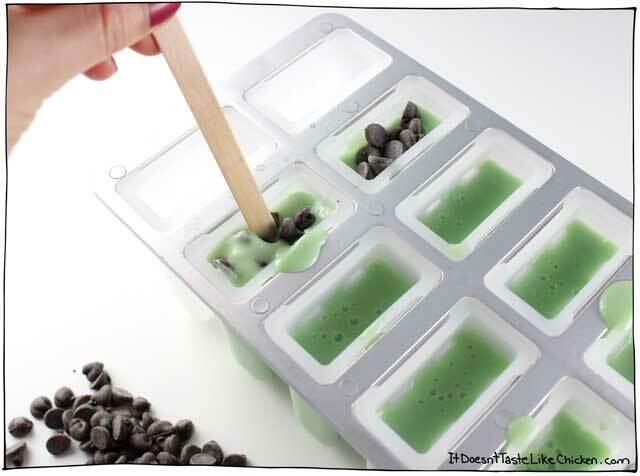 Pour the mint cream into the popsicle molds leaving about 1/2 an inch of room at the top to allow space for chocolate chips. Do not add the chocolate chips yet or they will melt. 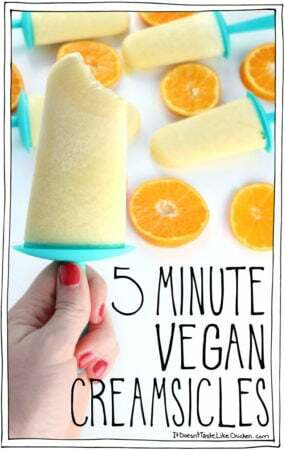 Chill the popsicles in the freezer for 1 hour. I finally purchased this fancy new popsicle mold from Amazon which made these perfect sized, classically shaped popsicles. Love it! Once the mint cream is chilled for an hour, you can now add the chocolate chips without them melting. Divide the chocolate chips evenly among the popsicles, and use a popsicle stick to push the chocolate chips down to spread throughout each popsicle. 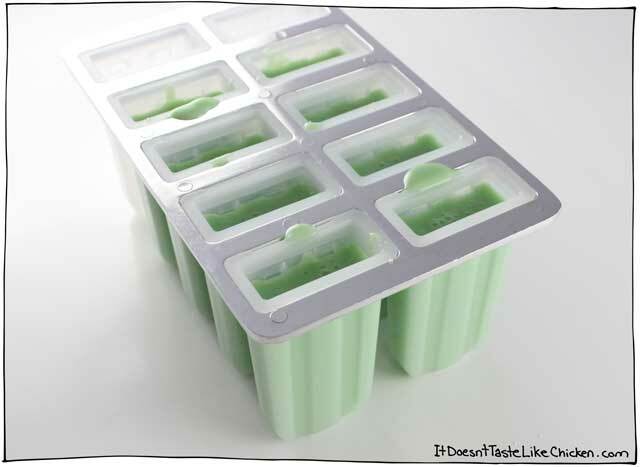 Put a popsicle stick in each mold and put the popsicles back in the freezer to set overnight. Vegan Mint Chocolate Chip Popsicles complete. Cute deliciousness overload! 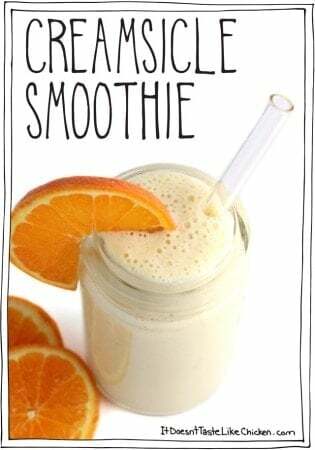 Easy to make, just 8 ingredients! 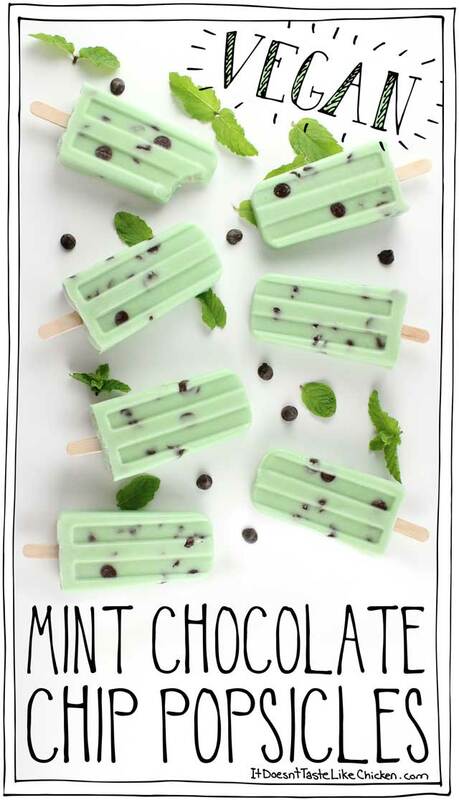 Creamy, lightly sweet, minty frozen treats. Perfect summer dessert. 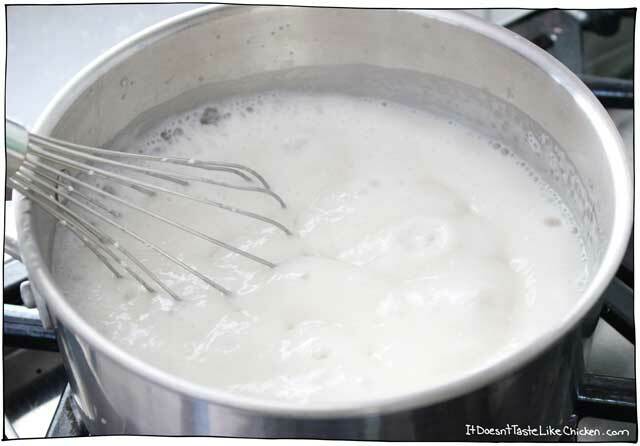 Add the non-dairy milk, coconut milk, sugar, and cornstarch to a medium sized pot and whisk well making sure the cornstarch is completely mixed it. Put over medium-high heat and bring to a simmer while whisking often. Simmer for about 5 minutes until the mixture thickens, being careful to not let it boil over. Remove from heat and whisk in the vanilla extract, mint extract, and food colouring. 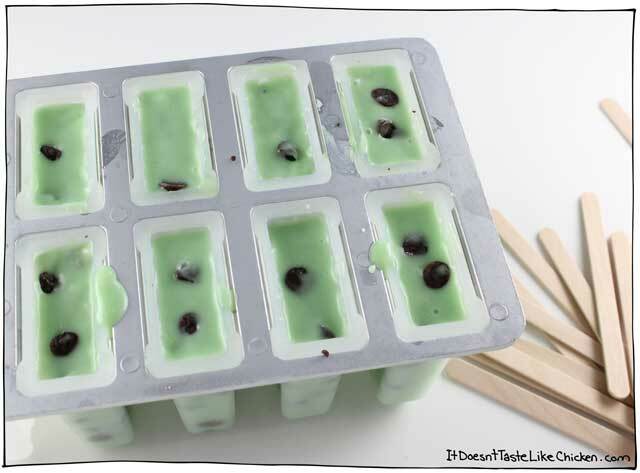 Once the mint cream is chilled for an hour, you can now add the chocolate chips without them melting. Divide the chocolate chips evenly among the popsicles, and use a popsicle stick to push the chocolate chips down to spread throughout each popsicle. Put a popsicle stick in each mold and put the popsicles back in the freezer to set overnight. I don’t have popsicle moulds yet, so I just made this as a batch of ice cream. I love that the ingredients are so simple. It turned out great. Oh I love that idea, will have to try it myself!! JUST MADE THESE TODAY. yummy!! 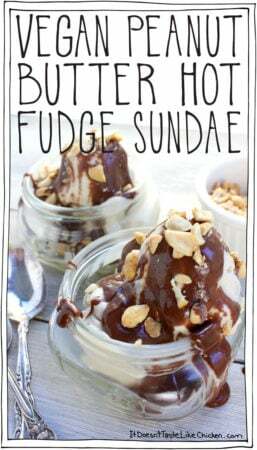 THIS RECIPE IS A KEEPER!! Congratulations on the book, Sam. After following you for three years this month (I checked, because yes, I keep the emails! ), I can’t believe how far you’ve come in such a short time. I can’t wait to see it. 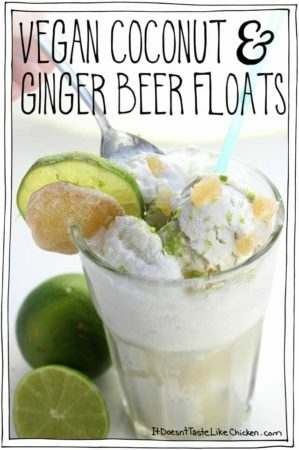 Nor can I wait to try this recipe, which comes at the perfect time, as my daughters are at the “bored” stage of summer vacation (having long ago reached “I’m hungry”), and it’s been hovering around 110 where we live. Thanks! Hi Cindee, not sure what the requirements are but maple syrup, agave, or corn syrup might work. Hope that helps, enjoy the popsicles! Agave works well, but make sure to stay with the golden, since the dark has a distinctive flavor and colors your item. Clare Russell.